Basic soap bases primarily contain all natural soap and a small amount of foam boosting additives, which produce a big bubble, creamy lather that customers love and expect with cleansing. The ten-pound block makes (40) 4 oz. bars of soap and measures 12" x 11" x 2.25". This soap is white with a big bubble lather. "Great quality and great price!" COMMENTS: Perfect for basic MP projects! COMMENTS: This is an overall good product for melt and pour. Very easy to use and very good quality. COMMENTS: Was good for trying out but soap didn't last long in the shower. COMMENTS: Easy to work with and creat geat designs. COMMENTS: I liked this basic soap base a lot. It melts smoothly and though I did probably over do it in the melting process on one batch this soap didn't burn or go crumbly on me which was a nice surprise since I knew I messed up. I used it both colored and uncolored for a layered soap that came out beautiful. "The best basic white MP base!" COMMENTS: I enjoy using this MP base. It's versatile and great for swirls and layered soaps. Holds fragrance and EO well. COMMENTS: This base has a very pretty pastel color when mixed with liquid dyes. COMMENTS: It is great !!! COMMENTS: Besides myself, my customers love the basic white, creamy lather, soap. If I use any other kind of soap base, they will tell ne, " this doesn't produce a good lather". With the white melt and pour soap, I can add different things like: powdered goats milk. Or rose petals from my rose garden, or any other dried herbal flower/buds, and not lose their color or texture. I have customers from around the country that order from me all the time using this kind of soap base. It holds soap dye colors and fragrances well. The only company I buy from is WSP. No one else sells a quality product and offers free shipping and coupons. • The larger loaf of white soap. COMMENTS: I love this product, its affordable and provided good quality finished products. 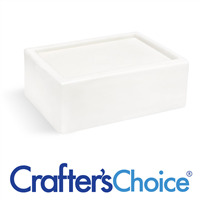 COMMENTS: This is my go to melt and pour soap base! COMMENTS: I love this item. Will buy again. Melts great, holds frag and color wonderfully. Couldn't ask for better product. COMMENTS: I purchased a 10 pound block of this melt and pour base and am pretty pleased. While it's not convenient to lug around a 10 pound bag of soap, it is a great product to have. It's extremely easy to cut into pieces and melts down quickly. My biggest pet peeve with this base is that it sets up very quickly and gets a thin "skin" over the top of melted soap, making it somewhat difficult to work with. I have to work with this in pretty small amounts because it sets up so fast, and have to repeatedly microwave my small batches. "Is this soap vegan? Is it all natural?" Staff Answer This soap base can be considered vegan but it is not all natural. 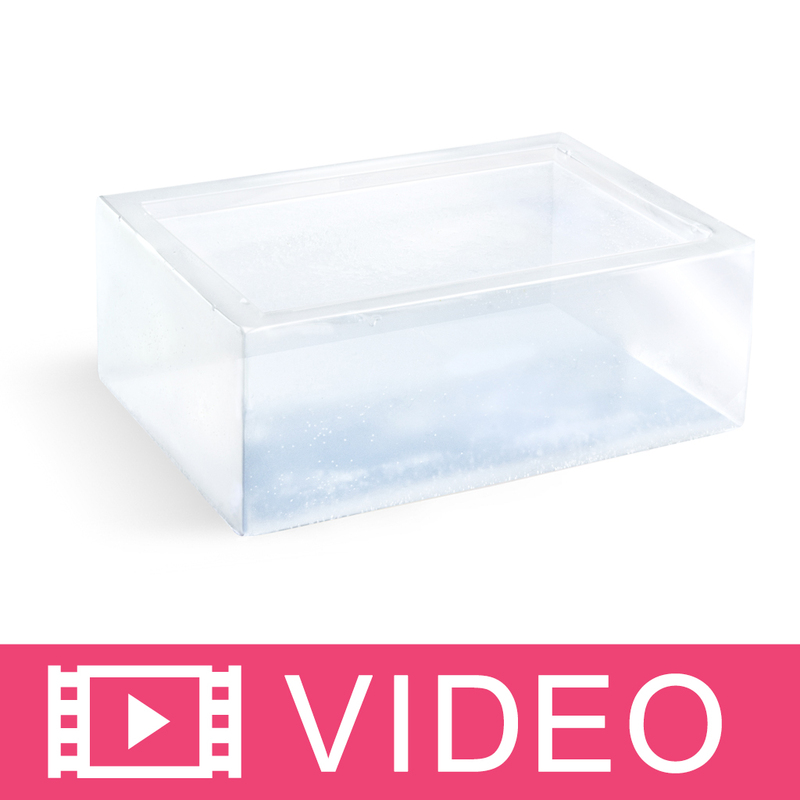 Our Detergent Free Soap bases are our most natural soap bases, without any added detergents. "Hi! What’s a recommended amount to add to foaming bath whip ? I want to make my bath whip products have more bubbles Thanks! " Staff Answer We have added 10 oz. of MP soap base to 16 oz. of bath whip when making a scrub. You can also add Bubble Up to the bath whip to give the product more bubbles. "Does this base contain coconut oil? " Staff Answer Yes, this base does contain coconut oil. Once the soap has saponified, it can be part of ingredients such as Sodium Stearate, Sodium Myristate and Sodium Laurate. "What is the water percentage in this soap?" Staff Answer That is proprietary information and not available.